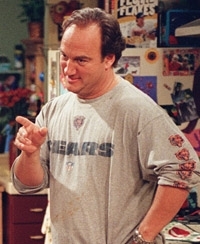 Jim Belushi, a native of Chicago, graduated from Southern Illinois University with a degree in Speech and Theatre. He then became a resident member of Chicago's famed Second City, from 1976-80. In 1979 he left for Hollywood, when writer-producer Garry Marshall cast him in the series Who's Watching the Kids , and later in Working Stiffs . Among Belushi's other television credits as an actor and writer are Saturday Night Live , Parallel Lives , the Oliver Stone/ABC miniseries Wild Palms , the movie Sahara and the critically acclaimed series Beggars and Choosers . In 2000 Belushi co-starred in Return to Me , and he received rave reviews for his work with Gregory Hines in Who Killed Atlanta's Children? It was his work in About Last Night with Rob Lowe and Demi Moore that brought Belushi his first serious attention as a film actor. In the 1986 feature, he reprised the role he had originated on stage in David Mamet's Obie Award-winning Sexual Perversity in Chicago , from which the film was adapted. His feature credits since then show an extraordinary range: He was James Woods' spacey DJ buddy, Dr. Rock, in Oliver Stone's Salvador ; a mentally handicapped dishwasher in Homer and Eddie ; and the defiant high school principal standing up to drug dealers in The Principal . Other starring roles include Joe Somebody , the K-9 franchise, Curly Sue , Taking Care of Business , Once Upon a Crime , Mr. Destiny , Red Heat , Only the Lonely , Thief , The Man with One Red Shoe, Real Men , Jumpin' Jack Flash , Jingle All the Way , Retroactive , and Gang Related . Belushi has performed on Broadway in Herb Gardner's acclaimed Conversations with My Father , off-Broadway in True West , John Guare's Moon Over Miami , and for Joseph Papp as the Pirate King in Pirates of Penzance . In addition he does numerous voiceovers for film, television and for commercials. He is the official voice of Blockbuster Home Video, and did one of the dog voices in Disney's wildly popular 2002 film, Snow Dogs . Besides acting, Belushi loves music. He has several music projects, including The Sacred Hearts and Big Men Big Music. The Sacred Hearts are a rhythm-and-blues band who have been together for six years, performing 40 nights a year at clubs, casinos and corporate events all over the country. They are the "official house band" for The House of Blues, in which Belushi is a partner, and have entertained former President Clinton and Vice President Gore. Big Men Big Music is a project that Belushi is doing with his friend, Dan Aykroyd. This band spent the summer of 2003 performing around the country. Belushi currently has three CD's out: Blues Brothers Live from Chicago , The Sacred Hearts' 36 x 22 x 36 , and the recently released Big Men Big Music CD, Have Love Will Travel . A dedicated husband and father, Belushi has little time outside career and family, but he has made a major commitment as founder and member of the board of the John Belushi Scholarship Fund, which supports college and college-prep students pursuing performance and visual arts education.